The Indianapolis Zoo offers visitors the opportunity to travel the entire world in the space of one day. The zoo welcomed a record 1.24 million visitors to its 64-acre campus in White River State Park near the heart of the city during the year 2014. About 2,000 animals live in the zoo's "biomes", or groups living in distinct regions simulated to resemble their natural habitats like oceans, deserts, forests and plains. This year, two very special visitors, Milo and Thackory, are attracting a lot of attention since arriving at the zoo in May of this year. These little fellows are 4-year-old male koalas living temporarily in the zoo's Forest area, where they will stay until September 7 (Labor Day) of 2015. 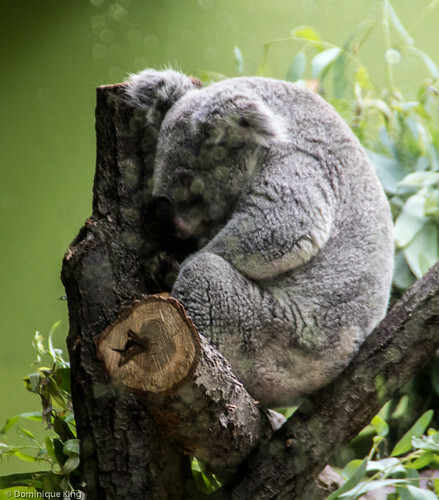 The pair, who are the first koalas to visit the zoo since 2008, seemed content enough to snooze the day away amid their beloved eucalyptus leaves as the nocturnal animals sleep about 20 hours a day, but they created plenty of attention and excitement among visitors who enjoyed this rare chance to see the cute little Australian natives. Conservation efforts include awarding the $250,000 Indianapolis Prize every other year to a conservationist or group that makes major contributions in the field to bring attention to the cause of animal conservation, research and education. The Zoo itself earned the highest awards from the American Zoological Association in 2001 and 2007, as well as earning the Indiana's Governor's Award for Environmental Excellence in 2010 for its Recycling/Reuse efforts. The Zoo's mission statement stresses the ideas of advancing conservation and sustainable growth, as well as a continued commitment to "creating and maintaining a diverse and inclusive culture in which visitors, employees, suppliers and community partners are respected and valued", noting that "...science has demonstrated that plant and animal diversity makes for stronger natural communities and the Indianapolis Zoo believes that diversity makes institutions stronger as well." The Indianapolis Zoo offers several ways for visitors to have an up-close-and-personal experience with the animals living there that include the nation's largest dogfish shark touch pool, the opportunity to have birds like budgies and lorikeets eat directly from your hand and the Simon Skjodt International Orangutan Center where the clever animals have plenty of room to swing and soar through the area, much as they might in their natural rainforest habitat. The Orangutan Center is a $21.5 million project that opened to the public last year at the beginning of the summer here in the U.S. The facility towers as high as 150 feet into the air with a 50-foot-high space that easily allows the resident orangutans to move from level to level by means of a network of trails, cables and bridges. 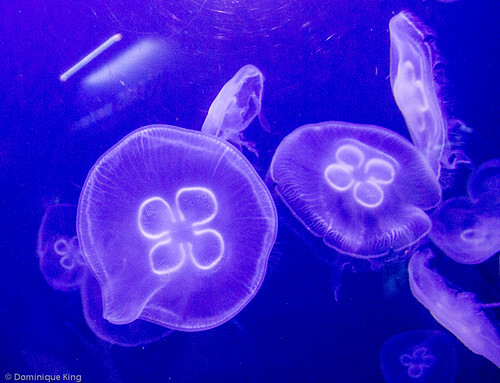 The movement of the animals controls lights adorning the center's tower every evening. As fun and beautiful as the center may look to the casual visitor, the facility's design helped meet the physical, social and intellectual needs of the resident orangutans while it conducts research vital to preserving the increasingly endangered animals that face a serious threat of extinction. 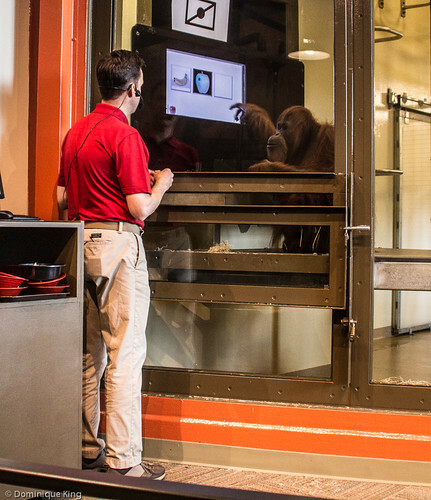 We attended a fascinating session with one of the zoo's research staff as he demonstrated one of the orangutan's ability when it came to recognizing the meanings of pictures and words and selecting the correct match between them on a computer! The Orangutan Center also has a "green roof" of low-maintenance sedum plants that collect much of the rainfall with the collected runoff going into 10,000 gallon storage tanks for use as irrigation at zoo. 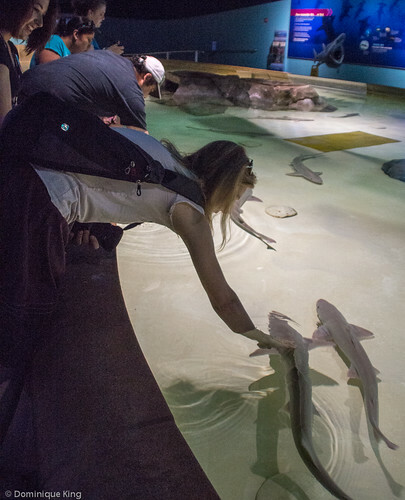 The Zoo also hosts daily 20-minute dolphin shows with the idea of demonstrating the bond shared by the Atlantic bottlenose dolphins and staff. The show happens in a million-gallon-plus pool surrounded by the re-creation of a coastal village and bleachers for show spectators. I liked the dolphin show but have to admit that it brought to mind the heated debates I remember hearing about Detroit Zoo and its discontinuance of the popular chimp shows (that I remember seeing as a child) during the early 1980s and the continuing debate among zoos, aquariums and marine parks about whether the wisdom of staging such shows. It's an issue I'd certainly like to learn more about. 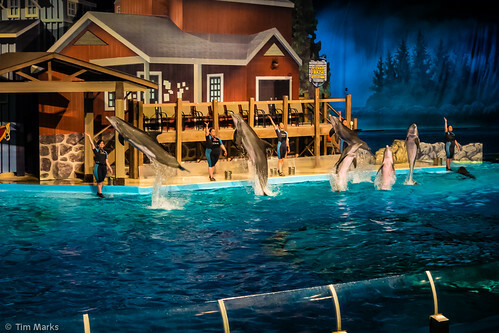 The dolphin show is part of the price of admission at the zoo, but visitors need to pick up a reserved ticket when they first enter the zoo because the shows have limited seating. Shows and rides also included with the price of zoo admission include the 4-D Theater, a menagerie carousel (which is wheelchair accessible) and a 10-minute narrated train ride offering a behind-the-scenes peek at zoo operations and its 15,000-square-foot vet hospital. The Zoo also has play areas that include the Family Fitness Playground near the center of the zoo that is fully accessible for children with physical challenges with equipment like a special slide and a play area covered by a rubberized walking surface that is also wheelchair-accessible. You can connect with the Indianapolis Zoo on the Web site, Facebook, Twitter, Instagram or YouTube. Check out my story about our experience Feeding the birds at the Indianapolis Zoo and be sure to come back next week when I post a story about the White River Gardens at the Zoo.